This is a single-image tutorial that shows, how the weave Moon42 can be made using preclosed rings, what opens the way to e.g. stretchy designs. Rings used for the weave samples are 1.6mm (16swg) coiled on 1/4" (6.35) mandrel; colored AA, as well as BA rings, so all rings have an AR in the 4.2 ballpark. The weave looks really fine at this AR, but a little lower, down to AR~3.8 will work, but become more difficult to weave, the nearer the low AR limit you come - there is no high AR limit, but above 5 or so, the weave becomes less attractive, in my opinion. 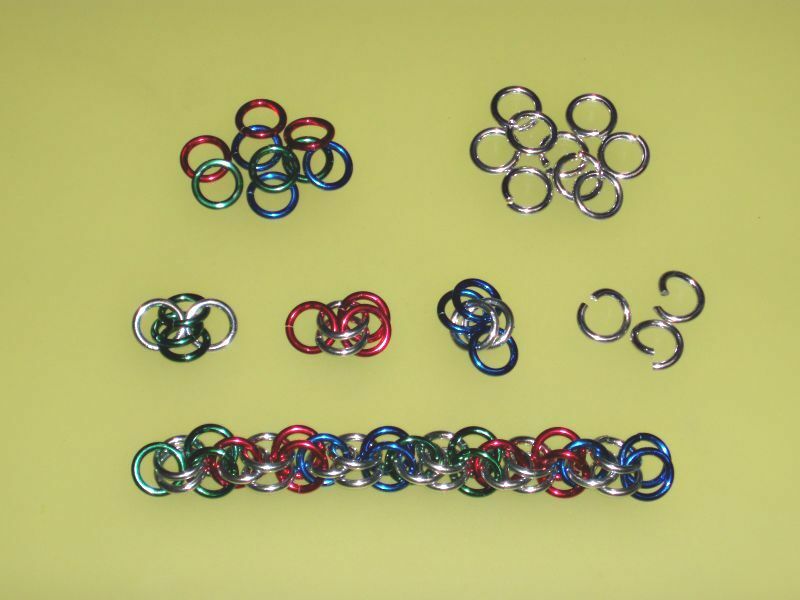 I used colored AA rings for the preclosed, and BA rings for the weaving rings. First prepare (or get in case of rubber O-rings) a number of preclosed rings, that can be divided remainderless by three. Then connect always three of these with two jumprings to a 2-3 (is 1-2-2) unit. These are the building blocks, that are connected thereafter to build the chain, by holding two of these in 1-2-2 orientation, sandwiching the single ring of the 1-2-2 followup block between the rightmost ring pair of the previous block, and then connecting with a single jumpring, in Harvest Moon style. Look closely, and you find out. The first couple of connections may be difficult, as you have not yet much to hold in your hand, but an added piece of wire to the starter cell gives a fine handle, that makes the task easier. 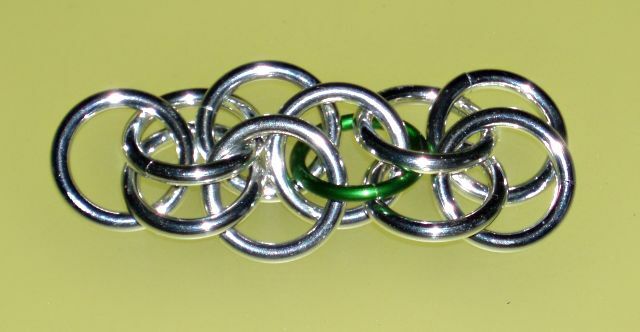 The following photo shows the way the linking ring has to be threaded through, hopefully better. I used some higher-AR rings to show this.